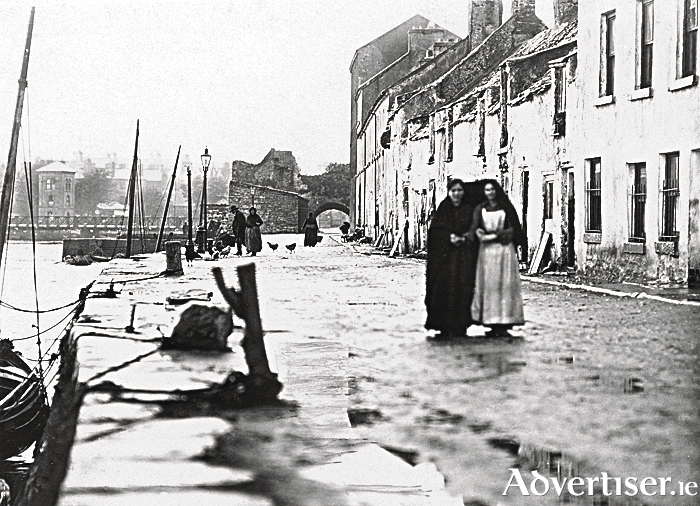 The Spanish Arch was originally an extension of the city walls from Martin’s Tower to the banks of the river. It was built in 1584 as a measure to protect the city’s quays. It was known as Ceann an Bhalla or ‘The Head of the Wall’. In the 18th century, Long Walk was built by the Eyre family as an extension to the quays, and a breakwater to construct a mud berth. A number of arches were constructed to allow access from the town to the new quay but some of these were wrecked by a tsunami which occurred after the 1755 earthquake in Lisbon. Long Walk was also known as ‘The Long Wall’, and later as Rope Walk because a local rope manufacturer used to spread his ropes all along the walk. While not quite of tsunami proportions, Long Walk is covered in water after a heavy shower of rain in our 1908 photograph. The two ladies in the foreground are sheltering under one shawl. You can see the remains of the building that once stood on top of the Spanish Arch, fishing boats moored along the quay and in the background is the old Wolfe Tone Bridge. Long Walk is beloved of visual artists and photographers. It has so many elements, old stone walls and arches, the river, the sea, boats, swans, a row of buildings painted in different colours, the old and the new, etc, that it must be the most recorded place in Galway. But it is anything but romantic in our photograph which shows it as a poor decrepit area with a rough street surface, a lone gaslight, chickens and hens wandering the road, window shutters taken down and left on the very rough footpath, and some windows barred. Most of the buildings were artisans’ houses, some were tenements. For example, a large archway further along led into “Greene’s Alley” in which there were five houses occupied by the Andersons, Kate McDonagh, Canavans, Mrs Gorham, and Martin Finnerty. The censuses of 1901 and 1911 record a huge number of people living here between Long Walk and Rope Walk. Among those were ‘Pateen’ Greene, Mrs Hosty, Mrs McDonagh who lived in a building known as ‘The Hall’, Mrs Lee, John Folan, ‘Bideen’ Joyce, Ella McDonagh, Mrs Folan, and Mike Walsh. The large house we see on the right of picture belonged to the Yorkes and it was there Fr Peter Yorke grew up. He was a noted republican and labour activist who became very famous for his work in San Francisco. He was a well known journalist, wrote a best-selling book titled The Ghosts of Bigotry, and has a street named after him in San Francisco. Out of picture on the right was a lime kiln owned by a Mr Mulkerrins and down at the end of the walk, around the corner, lived Sarah O’Donnell and also Tom Gannon.